If this is your first time checking out my blog, you might expect for my blog posts to be all about the 2012 London Olympics. The Olympics are great. They keep getting all of our attentions. However, I never forget that the 2012 college football season is a month away. As a senior student at Michigan State University and a huge Spartan fan my whole life, I cannot wait for another epic season for MSU Spartans to start. According to Tim Staudt, a reporter of Wilx, MSU’s football players will be officially reporting to campus this Friday that their first practice will be set for this Saturday, April 4th. “Media day is set for Monday and then preparation begins in earnest toward the season opening game” against Boise State, which starts at 8:00 p.m. on Friday, August 31st at home. “Mark Dantonio begins his 6th season as head coach” (Staudt, July 2012). Ever since Dantonio started being a coach, not only have the Spartans won more games than any other Big 10 team (24 games in the past 4 years), they have won 22 games since the 2010 season, which became the highest two-year total in program history and they became the seventh best among NCAA Football Bowl Subdivision Teams (FBS). 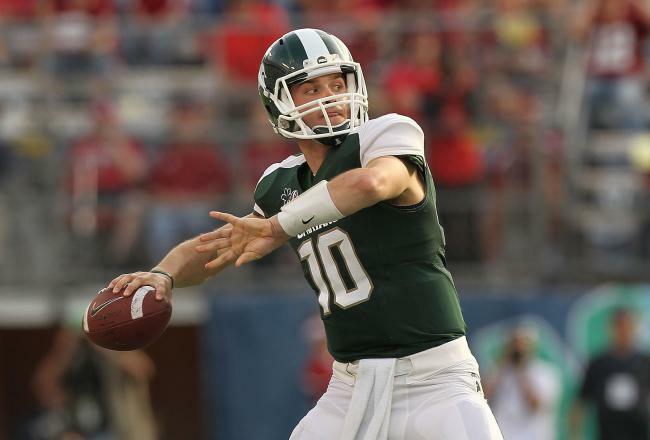 “Andrew Maxwell is ready to take over as Michigan State’s starting quarterback in 2012 (MSU Football Official Website). After Kirk Cousins left the team for a professional team, Andrew Maxwell (20), a Junior Quarterback, took over the role played by Cousins, a third-year-starter. Needless to say, the biggest game to pay attention to is the Spartans vs. University of Michigan, Wolverines at the Michigan Stadium on October 20. On July 27, ESPN’s Joe Schad talks about Maxwell’s ambition for this MSU vs. UM game in this season on Twitter. In addition to the Wolverines, the teams that you don’t want to miss are University of Wisconsin, Badgers (The Spartans and the Badgers’ last two meetings have made them a notable rivalry), Northwestern, Wildcats (They find a way to beat a ranked team in the Bowl Championship Series every year), as well as Nebraska, Cornhuskers (Taylor Martinez, a Junior Quarterback, is expected to be a large part of the team’s strong offense). With the new season around the corner, if you know which athletes and what games to pay your extra attention to, you can enjoy and be more knowledgeable about the games! Be excited for the 2012 College Football Season! We have all heard a trademark of Nike, “Just Do It.” This single-slogan has not only motivated many people around the world to be active, but also gave Nike $18.5 billion business and changed its marketing strategy since 1988. However, people now demand Nike to not just say ‘Just do it,’ but to say ‘Help me just do it.’ Let’s see what Nike has been offering as a major part of its marketing strategy.